More Than Just A SAHM: Twister Fries Here!! 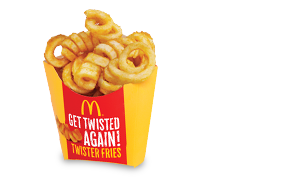 I just love Twister Fries period! And today is Saturday, are you ready for your order? I should grab Twister Fries now or my weekend will not be complete. What's more? There is no minimum orders at Mcdelivery, just a fixed delivery charge of P40 and this will be up for a limited time only. looks like something that i'd go for everyday, lol! guess i'll have to wait for it to come to South Africa!